Impromptus were next—A-flat major (op. 29), F-sharp major (op. 36), G-flat major (op. 51), and C-sharp minor (op. 66)—and they were all shaped masterfully, every detail turned... and even a series of extraneous noises (at least six cell phones went off during the concert, and apart from the usual coughcophony, every five minutes someone seemed to be dropping their loose change or car keys or unwrapping candy) could not lessen the delight that it was to listen him. Not by much, at any rate. Nikolai Medtner is a wonderful Russian composer, almost as underrepresented now as he was a gifted composer. His sonata hybrids, like the Sonata Reminiscenza in A minor, op. 38, no. 1. that Kissin presented in the second half are well worth listening to. 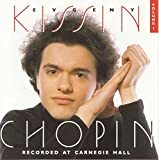 This particular work (punctuated by dry coughs, preferably in pianissimo sections) is a reflective musical meandering, contracting and expanding and dotted with ferocious interludes that give the Romantic virtuoso everything he needs to showcase his abilities. If those are as bountiful as Kissin's, the Sonata Reminiscenza becomes a memorable little gem. With a lesser artist in charge, I suppose it would make me question its musical merits. Stravinsky's Pétroushka Suite is probably the most difficult work in the mainstream repertoire, which usually ignores the likes of Godowsky, Alkan, and Kapustin. Maurizio Pollini's recording of it offers some of the best quartersome hour of piano playing on record. 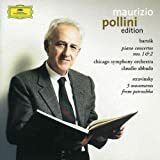 Where Pollini has Kissin on clarity and "pronunciation," Kissin—apart from the inherently unfair comparison of a recorded to a live performance—gave splashes of extra color and, to my delight, a touch of rawness that makes the core of Stravinksy's ballets. Stravinsky's piano versions of his scores, when well performed, never make me wish for the orchestral garb and they certainly don't sound like "reductions." What Kissin delivered, in the Suite as for the entire evening—fully deserved the overused description of "brilliant"! The audience, inexcusably noisy as it was during the concert, thanked Kissin with enthusiastic standing ovations and, more meaningfully, by staying in the hall. Relentless applause almost forced Kissin to delight with four encores: a Liszt transcription of Chopin's The Maiden's Wish, Moskowsky's Spanish Caprice (which had the audience stunned into submission), Earl Wild's transcription of the Pas de deux of Tchaikovsky's Swan Lake, and finally Godowsky's Viennese-melancholic The Old Piano.